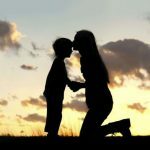 Home Home Improvement Guide Should You Choose Pallet Wood Floor Over Concrete? Redecorating your home and looking for floor options? Look no further! One of the best things you can choose for your floors is pallet floors, as you’d have fantastic warm and wooden floors at a fraction of a price of hardwood floors. 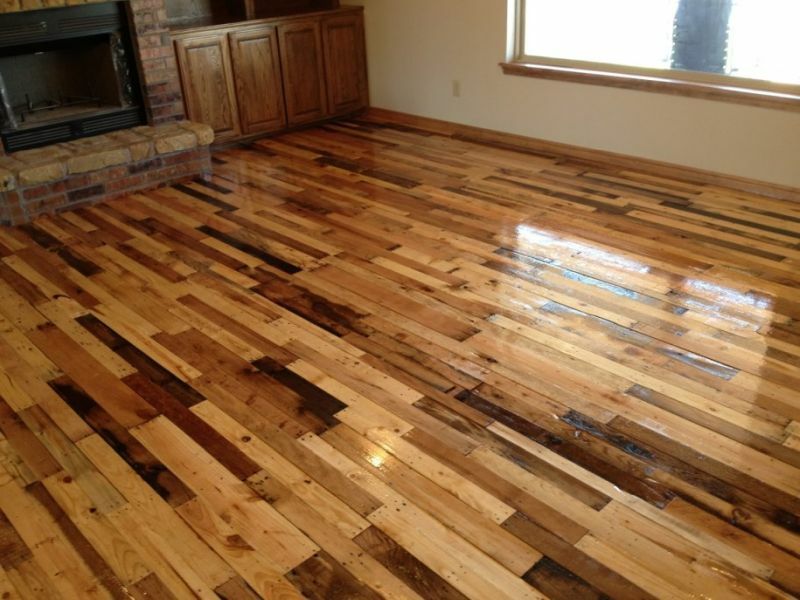 Pallet wood floor over concrete is a much better eco-friendly flooring option. Instead of letting lovely pallets cluttering up the landfills – why not use them as economical and beautiful flooring for your home or office? 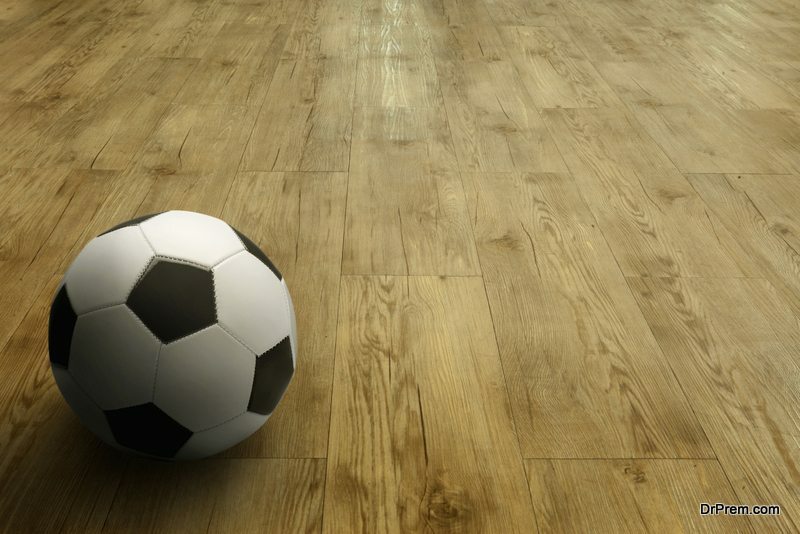 Why should you choose pallet wood floor over concrete? Concrete contributes to a lot of pollution during its production. We live in the concrete jungle, which is far from the real jungle. But, if you use pallets to make your pallet floors and walls, you would be reducing environmental pollution as well as saving space in the landfills. Pallets can be used for your walls too, which would look spectacular. You have the freedom to design your own floors using the pallets of your choice. Long planks or short, you can design the floor of your choice at a fraction of the price for concrete or hardwood floors, which gives you more reason to choose pallet wood floor over concrete. Where to find the much-needed pallets? With the proper permissions, you can get pallets from businesses, landfills, and individual sellers as well. Many stores give their pallets for free, so do check with the stores around you to find the materials for your pallet floors and walls without making a dent in your wallet. Some stores are likely to sell pallets to you for throwaway prices. Department stores, warehouses, and grocery stores can provide you with the pallets you want. Garden stores, small hardware stores, and new businesses will be happy to get rid of their pallets. So check with them too. However, you have to have patience as it might take some time to gather each and every pallet you need for your floor. Also, remember that it might be difficult to build your own DIY floor of the same type of pallet. So, be prepared to mix different floor planks, some made from dark wood and some from a lighter one. Before you start to collect pallets for your easy DIY pallet floor, you must arrange for a place to store them. The storage place should be as dry as possible – with no insects or moisture to spoil them. When you’re on the quest to find the perfect pallets for your home, make sure that they are chemical free and germ-free. In order to do this, only use the pallets that have the IPCC logo and avoid the ones which are marked CT (Chemically Treated) or MB (Methyl Bromide). Colored pallets should also be avoided, as they may contain formaldehyde. Keep away from pallets which were used previously in the food industry – especially to store meat. Seek out dry pallets which have HT (Heat Treated) marked on them. To make your own easy DIY pallet floor, you will first have to prepare the pallets. You can break the pallets with a claw hammer, crowbar, or pallet breaker. Circular saws can cut up the planks in no time at all, but you will not get bigger pieces with circular saws. However, the plus point is that you won’t have to use crowbars or claw hammers if you use circular saws. Another important point is that you have to remove all the nails completely from the wood before you start making your floor. How to make the pallet floor? 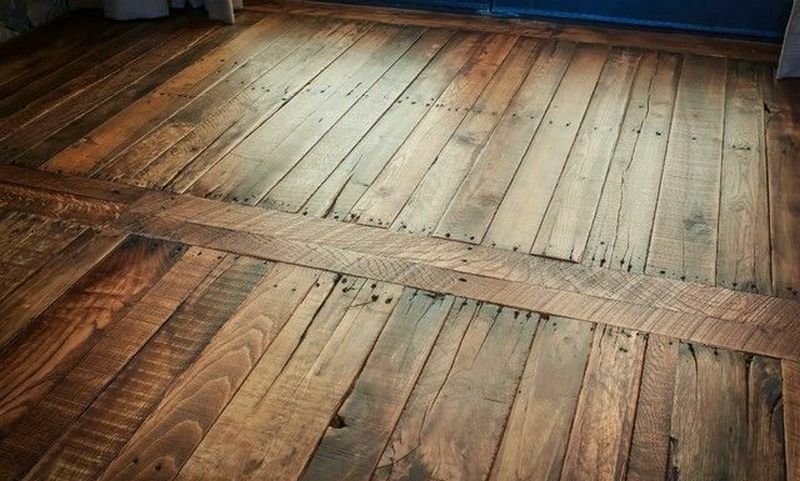 One DIY idea for a pallet floor: For this, you will need 2,3,4,5 inch wide pallet pieces, wood wax, and mineral spirits. Glue the planks in this order: One 2-inch row, four 3-inch rows, one row of 4-inch, four 3-inch rows and one 5-inch row. You can follow this pattern to complete the floor. Dust and clean the floor. 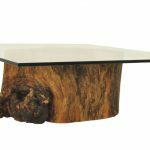 Apply mineral spirit to each piece of wood. Add the finish. Your flooring masterpiece is ready. Pallet wood floor over concrete floor is a good choice. You can have a stunning, eco-friendly floor at a minimal cost. These floors last a long time. The best thing is, if it becomes damaged, you just have to replace the damaged portion – which is again very economical.